Whenever a natural disaster like a hurricane or earthquake strikes, people ask us about using shipping containers in disaster relief efforts, usually as temporary housing. After all, they are mobile, secure and quickly deployed, which is ideal when people need emergency shelter. We see the potential, too, and we want to expand the conversation. Using container structures as temporary housing can be a good option for disaster victims in specific circumstances, but shipping container structures also have versatile use as mobile water treatment plants and secure storage. In a fascinating academic paper titled “Using shipping containers to provide temporary housing in post-disaster recovery: Social case studies,” the authors examined whether shipping containers could have assisted the disaster recovery processes after Hurricane Katrina, the 2011 Christchurch earthquake in New Zealand, and the Black Saturday bushfires in Australia. The answer varied on a case by case basis. 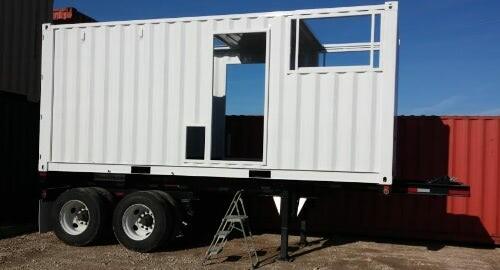 Container-based housing structures are more expensive than most people realize—sometimes upwards of $30,000 a unit. The vision of thousands of displaced people in shipping container villages is probably unrealistic because of the cost. Still, when peoples’ homes are uninhabitable but the land itself is safe, container structures could be an option for victims who prefer to stay on their private properties. The research paper highlighted how scenarios similar to the Black Saturday wildfires in Australia were ideal use cases. While the Black Saturday wildfires severely damaged the homes of an Australian agricultural community, victims understandably wanted to stay as close to their land as possible. Unfortunately, rebuilding permanent homes—especially in countries with stringent building codes—can take years. The researchers noted that some people were living in make-shift shacks on their properties years after the Black Saturday fire. 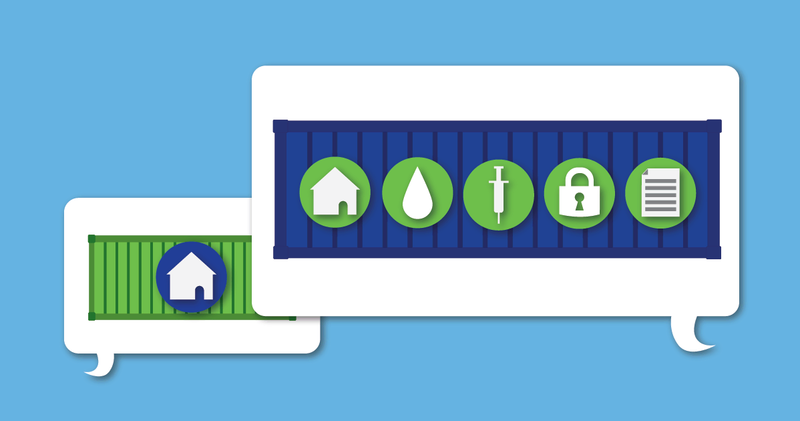 If disaster victims opt to purchase and temporarily live in a container unit on their private property, governments or non-profits could offer vouchers to cover part of the cost. Since containers-structures can last for decades, relief organizations could also purchase a fleet of container units and run buy-back programs, redeploying emergency container structures for decades. Not every disaster victim will be best served by a container, but people seeking medium-term temporary housing that’s more secure than a trailer may appreciate having container structures as an option. Admittedly, the best use of shipping containers is narrow when it comes to housing, but they have a lot to offer emergency relief workers as mobile workspace and storage. Most disaster response organizations don’t have the resources to keeps hundreds of emergency container shelters on stand-by but maintaining a few containerized storage and work spaces for flexible applications is economical. For instance, a climate-controlled container could provide secure storage space for medicine or documents in the field and then function as a spare office during downtime. The non-profit Hospitals of Hope already uses containerized infirmaries. Their mobile clinics are particularly helpful for disaster relief in remote locations, where quickly transporting a patient to a hospital isn’t possible. With special modifications containers serve as a plug and play work space with all the medical equipment packed and ready to treat patients. Governments and non-profits could also quickly deploy containerized equipment to get the essentials like water and power up and running. For example, containerized water treatment plants could temporarily handle waste water and containerized generators could serve as a weather resilient power source until power lines were repaired. We know better than anyone that modified shipping containers have a remarkably diverse applications. Temporary housing is an option, but if it’s the center of the container conversation, disaster relief organizations may miss out on broader—and arguably better—container uses. As leaders in disaster relief efforts think about containers, we hope they consider their full range of potential, especially as containerized offices and enclosures. 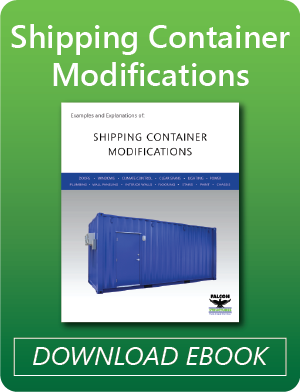 Wondering if a modified shipping container is right for your project? Call us at 877-704-0177 or email sales@falconstructures.com.